The double-wall pipeline is sloped during the installation to ensure its contents will drain back into the storage tank . So we could install a DLLS-2D double-wall pipeline leak sensor which connects the lowest point of the interstial space of the double-wall pipeline with a fuel collecting tube . 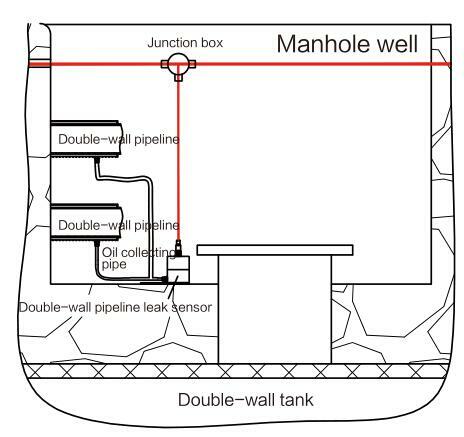 If any leak happened in the pipe , the liquid in the interstitial space will flow to the lowest point of the pipe and then go through the fuel collecting pipe to the container of the DLLS-2D double-wall pipe leak sensor . When the sensor detects liquid, then an alarm will be activated . ● Real-time monitoring whether liquid exists in the interstitial of the double-wall pipeline . Once the fuel was detected by the sensor , it will trigger an alarm .